0 Comments Published by Cedric Benetti on Monday, July 30, 2007 at 7/30/2007 06:32:00 PM. Finally, after so many years, the restoration works on the Tour St-Jacques-de-la-Boucherie are slowly showing their results. And the results are breathtaking! 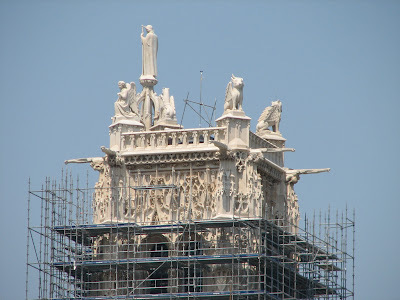 The tower has been surrounded by scaffolding and obscured by sheeting for long years (I actually never saw the tower since I live here), as surveyors investigate the condition of the stone and are doing an extensive iconographic study on the abundant decoration. Their recent findings show that happily the existing fabric is far more original than thought and that much ornamentation previously attributed to the imagination of the 19th century restorers is the genuine, late-medieval article. Unfortunately they also found lots of cracks which have made the tower a dangerous spot to stand around as a tourist. 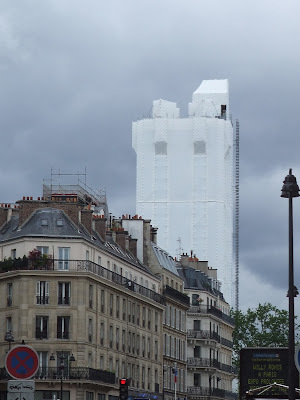 Actually the obscured tower has been standing hidden under its heavy scaffolding for such a long time, that it has become a point of orientation to many parisians, who now seem to be a bit lost, since the top of the tower is being unveiled from its boxy iron cage. Confusion even got me at first, when looking at the usually monolithic grey structure: "What the hell is that thing? Where did they put the ugly scaffolding?" According to city hall officials, the tower will be unveiled to the public level by level, as the restoration work continues to work itself down to the base, and finally putting the surrounding green square (now a heaven for homeless) back into its past glory.